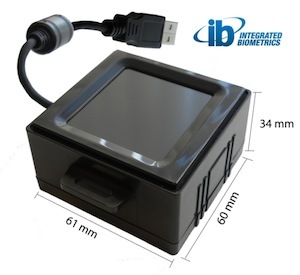 Biometrika’s HiScan fingerprint scanner has been certified by the FBI according to PIV Image Quality Specifications. HiScan is a professional fingerprint scanner with a large acquisition area (1″ × 1″), conceived to become a reference in the single-finger scanner market. HiScan has been specifically designed for government and forensic applications and, more generally, for all the applications where large sensing area and high image quality are required. Examples of applications include biometric passport and border crossing, ID cards, airport security and ATMs. HiScan exceeds PIV Image Quality Specifications. HiScan is a professional fingerprint scanner with a large acquisition area (1″ × 1″), conceived to become a reference in the single-finger scanner market. HiScan has been specifically designed for government and forensic applications and, more generally, for all the applications where large sensing area and high image quality are required. The high quality optical design makes HiScan an ideal solution for applications requiring a high level accuracy and interoperability with international standards (e.g., forensic and civil AFIS, border control, electronic passport, visa, identity card, etc). HiScan is completely designed and produced by Biometrika, is available both in DESK and OEM and supports not only Windows Operating system but also Linux. HiScan can be used as a simple device for acquiring high quality fingerprint images or, in combination with the Biometrika FX3 engine, to create complete biometric solutions for fingerprint-based identity verification or identification. HiScan is also supported by third party recognition software like Verifiger SDK from Neurotechnologija.